New information has emerged about the leaderless Occupy Wall Street (a.k.a. "Occupy Everything") movement that spontaneously erupted in hundreds of cities that suggests "career community organizers" may be behind the movement. With thousands of emails in the recently discovered archive, journalists are asking for help to read and review them all: "In keeping with the new media notion of crowdsourcing - enthusiastically embraced ... when trawling through Sarah Palin's emails - Big Government will be providing readers later today with links to a document drop consisting of thousands of emails." Many of the emails have already been published (see link). 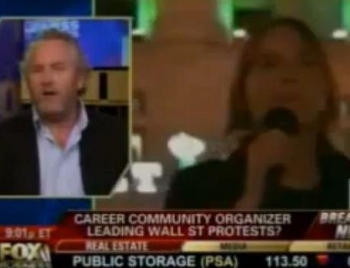 According to BigGovernment's Andrew Breitbart, interviewed on Fox Business last night (see VIDEO below), "the archive includes emails, for example, from radical anarchist organizer Lisa Fithian ... who is one of the leading organizers behind the Occupy movement." On the Occupy movement, Breitbart said "they're trying to act like this is utterly grass roots, that it came out of nowhere, but Lisa Fithian has been organizing these type of rallies, putting together anarchist groups, socialist groups, pro-palestinian groups, bringing the union, she has worked directly with unions such as SEIU in the past, that's exactly what you are seeing here. We are going to be breaking at BigGovernment ... that it's a bunch of radical left wing activists, including Lisa Fithian, organizing in a Google group where they are openly talking in this email chain, pre-dating the September 17 beginning of the Occupy Wall Street event... started on September 14, we have emails, thousands of them, that show how they are attempting to organize the destabilization of the US Government and global markets." Breitbart claimed that "Lisa Fithian has been everywhere around the world trying to create destabilization of global markets and global governments, she was all the way back at the WTO, anti-WTO stuff in 1999 in Seattle". "I have no issue with property destruction. I think sometimes it's appropriate, sometimes it's not. Again, I look at it strategically. Does this help us or does it hurt us? Does it help us achieve our goal, or does it not? We're in a society where property is idolized, so a lot of people don't get it yet that it doesn't really matter. It's just glass or products." Citizen Patriot Response founder Brandon Darby states that "we will be among many others who are investigating this email archive and we encourage all patriotic and liberty-minded organizations to do the same." Darby also has blogs on BigGovernment and TexasGOPVote as well as on the Citizen Patriot Response website.